Smart businesses enable staff to automate repetitive tasks and boost daily output with Office 365 apps for business productivity. 120 million is the astonishing number of active business users using Microsoft’s Office 365 cloud platform. What’s more, by 2020 Microsoft forecasts two-thirds of all Office business users will be in the cloud. Don’t wait and be a laggard who thinks Office 365 is just email, Word, and Excel in the cloud. Because you’ll be wrong and be hindering your business productivity in the process. Office 365 is a complete business collaboration and productivity platform. Office 365 apps for business productivity are designed and built to make work easier and you more productive. The following five business productivity apps are just a taste of what Office 365 offers. These cloud-based and mobile-friendly apps will help you buckle down and improve your efficiency in the office, on the road, or at home. Designed to keep you organised wherever you are, this is a user-friendly task management app with intelligence built-in. 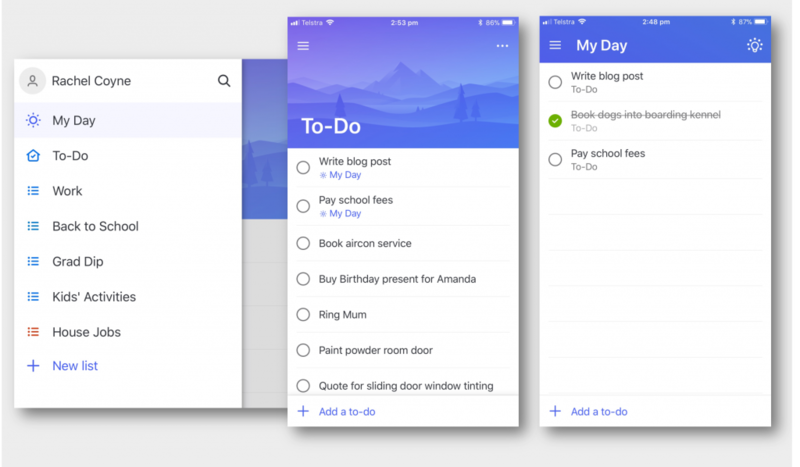 To-Do leverages the Office 365 cloud and an intelligence algorithm to help you prioritise tasks with the “My Day” feature. Encouraging you to focus on your daily tasks, the intelligence feature makes suggestions about prioritisation and offers a fresh list every day. It’s simple to use and there’s a version for iOS, Android, and Windows. Use it on any mobile device and add tasks or make notes when you’re on the go. Then when you get back to the office you can synchronise with Outlook. Want feedback from your colleagues about when and where to have the next work drinks? You can do that with Microsoft Forms. This very cool tool is part of the Office 365 cloud and allows you to create surveys, quizzes and polls and see results as they come in. It will work with up to 5000 recipients so it’s a great platform for gaining insight into the thoughts of your target audience. Its user-friendly interface and ease of navigation mean the interactive portal allows your audience to join in and post their opinions and thoughts. There’s also a built-in analytics tool to help guide you through evaluating the responses received. Sending your Microsoft Form is easy too. You can email it or embed the link in any web page, and better still, recipients don’t need to be Office 365 users. Does your daily work life usually involve shuffling between different apps and making connections between data? Microsoft Flow is a business productivity app designed to automate some of your more repetitive tasks. Built around the concept of automating workflows (called Flows) across different applications, it lets you connect to different services and simplify work life. But, the best thing is it’s not restricted to Microsoft services. 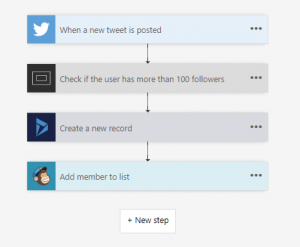 A Flow could be something like pulling information from Twitter or Facebook and adding it as a sales lead in Dynamics 365. In fact, it can integrate with hundreds of applications allowing you to build quick workflows and automating potentially thousands of tasks. But to get you started, there are some great Flow templates available on from Microsoft. This is the new collaboration software in Office 365 apps is set to replace Skype for Business. It’s a chat-based workspace in Office 365 that integrates all the people, content, and tools your team needs to collaborate and improve productivity. Built on the Office 365 cloud platform, it integrates perfectly with all the other Microsoft 365 tools. It offers easy to follow threaded chats and easy video meetings. You can also make audio and video calls with your team members via the mobile apps on iOS and Android. Furthermore, the latest update allows you to call external numbers (depending on license). There’s also a cool bot called T-Bot which can interactively answer your questions as you navigate your way around Teams. Low-code/no-code app building is hot right now. And this is the beauty of PowerApps. Designed for those who don’t necessarily know coding, but are savvy with formula logic in Excel. The type that want to have a go themselves rather than rely on the IT department. So, if this is you, you’re in luck. 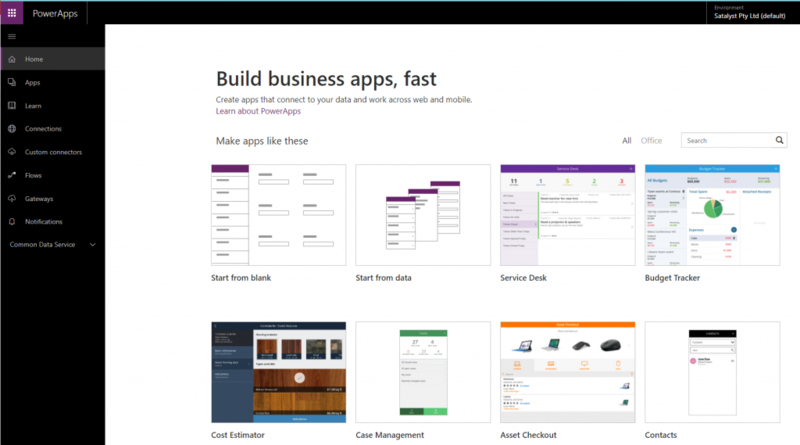 With PowerApps you can easily build business apps for mobile that run on iOS, Android, Windows, and through most internet browsers. What’s more, you don’t need to create a different app for each operating system. PowerApps essentially allows you to create an app within an app, like a container that makes mobile apps run easier across all mobile platforms. An easy drag and drop user interface allows you to add different controls (e.g. text field, choice field, etc), media (images, video, camera controls for your phone), forms and screens to build your mobile app. It also allows you to connect to the common cloud services (e.g. everything in Office 365, Twitter, Salesforce, etc.) and store data directly inside the app. Microsoft also provides some useful templates to help you get started. Once you’ve created an app, all you need to do is publish it and share it with your organisation. Sending emails and messages, writing reports, and analysing numbers are vital everyday functions that underpin any business. Microsoft Office 365 is the leading business and productivity platform, with updates and new features and enhancements being released daily. Satalyst is a Microsoft Cloud Solution Provider. Therefore, we can help you with Office 365 apps, subscriptions, migration from on-premise to cloud, or data migration from subscription to subscription. Interested in Office 365 or want to know more about how Office 365 apps for business productivity can help you and your team achieve more? Contact us or fill out the form below and we’ll be in touch ASAP.